I have long thought that feta was the most useful cheese you could have in your fridge, and a recent trip to Greece convinced me of it. I ate feta from breakfast to bedtime, in salads (of course), breads, risotto, dips, and pies both sweet and savory. I had squid stuffed with feta; cooked greens topped with feta; and fried feta with sesame seeds and honey. Here’s the highlight reel plus a recipe for one of my favorite dishes from the trip. On my first morning in Athens, I got up early and took a walk. It was a national holiday and the streets were deserted apart from a movie crew filming a fake protest march and the pushcart koulouri sellers. Koulouri are sesame-covered bread rings, like soft Greek bagels. I bought a cheese-stuffed one, assuming the cheese was feta. It wasn’t, but it will be when I recreate them. Watch Planet Cheese for the recipe. Observing a master baker prepare a savory cheese pie at the Forno Vasilios in Markopoulo was awe-inspiring. 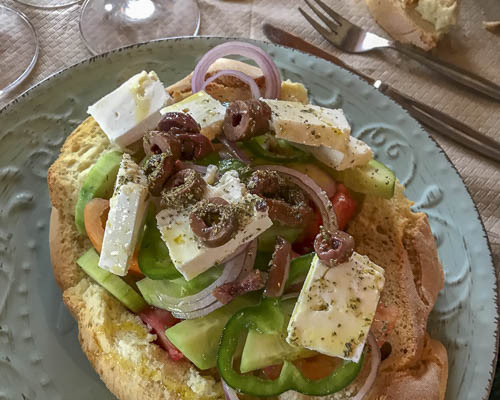 She assembled it in about 5 minutes, rolling out two paper-thin dough rounds for the bottom and two for the top; the filling is a blend of feta and a ricotta-like cheese called anthotiro. The pie was baked in a wood oven. I’m on a mission to master this dish but it may take a few years. 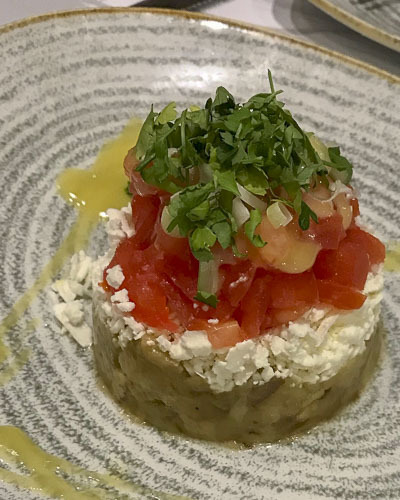 Dakos are Cretan bruschetta prepared with hard barley rusks softened with water, then topped with olive oil, tomato and feta and sometimes capers. I thought the presentation at chef Georgios Manikas’s restaurant, Mario, near Kalavryta was particularly appealing. The barley rusks are hard to find in the U.S. A thick slice of day-old whole-grain bread will do. 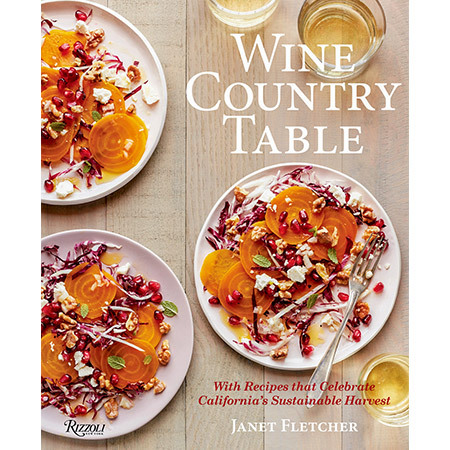 So many ways to re-imagine the traditional horiatiki, or Greek salad. Bread fanatic that I am, I loved the idea of serving the salad from a hollowed-out loaf, as prepared by chef Manikas. I never use pitted olives myself—I prefer whole Kalamatas—but you get the idea..
There’s a lot of be said for simplicity. Feta draped with roasted red peppers and dried oregano in a moat of extra virgin olive oil is my kind of lunch. We’re at Modigliani, an ouzeria in Thessaloniki’s Kapani market. 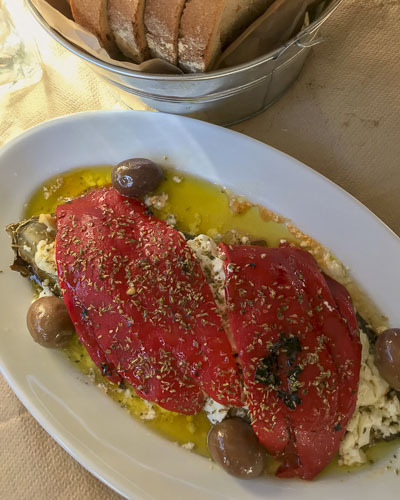 I would have been contented with this dish alone, but that’s not the Greek way. 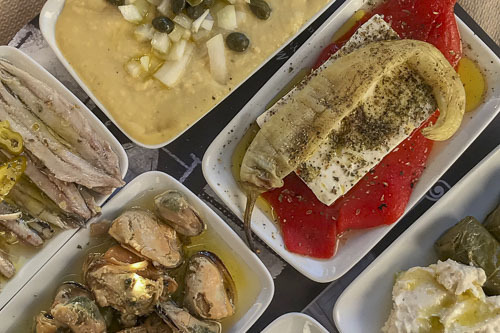 The tiny bar sent out a flotilla of mezze, pictured above. Only about 15 percent of Greek PDO feta is still barrel-aged, the traditional way; the remainder ages in tins. As with oak-aged wine or clothbound Cheddar, the air exchange enhances feta, adding complexity. 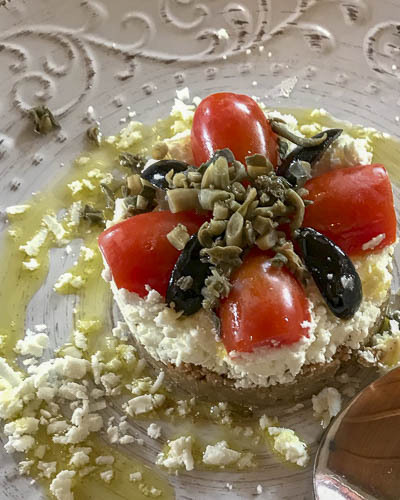 Kostarelos, a creamery near Athens, makes only barrel-aged feta and it is sublime, both at 4 months (creamy and mellow) and at 12 months (lemony and tangy). Cheese Plus in San Francisco has Kostarelos feta. Whole Foods has Kourellas and barrel-aged Mt. Vikos, both excellent. Baked feta shrouded in crackling kataifi (shredded wheat) is going into my dessert repertoire. This version from chef Manikas is topped with honey and black sesame seeds. Some people replace the sesame seeds with chopped pistachios. We also had it with a lemon syrup in place of honey at the Marmite Cooking Lab in Thessaloniki. Plagios in Volos was one of the more contemporary restaurants we visited. I enjoyed the presentation of these two feta-based dips: one with sun-dried tomato (left), the other with roasted red peppers. They were super-fluffy, probably made in a blender with olive oil and garlic. Fortunately, there was some crusty, whole-grain bread to spread them on. 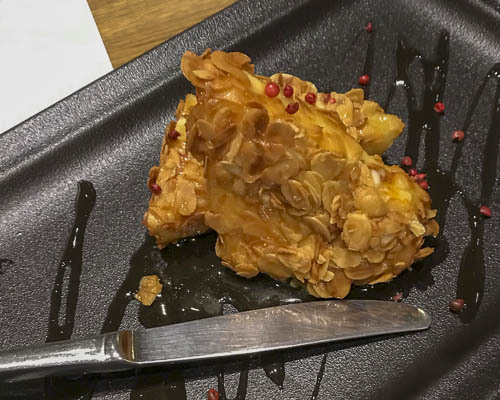 Plagios’s eggplant salad with feta and tomato was also creatively presented, but perhaps the most intriguing dish was the fried feta coated with sliced almonds and pink peppercorns (below). Brilliant. Linguine with caramelized onions, thyme and feta was another Plagios invention that I’ll be making for dinner. One important thing I learned about feta on this trip is that I had not been making my brine salty enough. Whether it’s aged in a barrel or a tin, feta matures in a brine that’s 6 to 7 percent salt. The feta itself (minus the brine) is just under 3 percent salt. Store it in a brine that’s somewhere in between. A 5 percent brine would be 2 tablespoons plus 2 teaspoons salt dissolved in 1 quart water. I had shrimp saganaki twice on this trip and prepared it soon after returning home. Feta makes the tomato sauce creamy, but the splash of ouzo is the mystery flavor. I took the photo at Ta Nissia, a seafood restaurant in Thessaloniki. But the recipe is from Marmite Cooking Lab, a delightful cooking school in Thessaloniki where I took a class from owner Smaragda Makri. Serve with crusty bread or stir in some plump cooked white beans (like Greek gigiandes) before serving. Season the shrimp all over with salt and pepper and set aside. Heat 2 tablespoons of the olive oil in a large, heavy Dutch oven over medium heat. Add the onion and sauté until softened, about 5 minutes. Add the Anaheim chile, garlic and as much serrano chile as you like. Cook, stirring, until the vegetables are soft, 3 to 5 minutes longer. Add the tomatoes, ½ cup water and a generous pinch of salt and pepper. Bring to a simmer and cook until the sauce is thickened and tasty. If it seems too tart, add a pinch of baking soda and cook for 1 minute; baking soda will mellow the tomato sauce noticeably. In a large skillet over medium-high heat, heat the remaining 2 tablespoons olive oil. Add the shrimp and cook for about 2 minutes on both sides, until almost done. Add the ouzo and cook, turning once, until the shrimp are hot throughout, about 1 minute. Transfer the shrimp and any pan juices to the tomato sauce, along with feta and parsley. Cover and set aside to cool a bit. Serve warm, not hot.